Please take some time to read though the website for answers to your questions before contacting as most are answered throughout the site. Waiting list for kittens is now closed. Not accepting any more applications at this time for kittens as my waiting list is full. The Russian Blue has a very soft and silky short double coat with guard hairs that give it a distinctive silvery sheen. 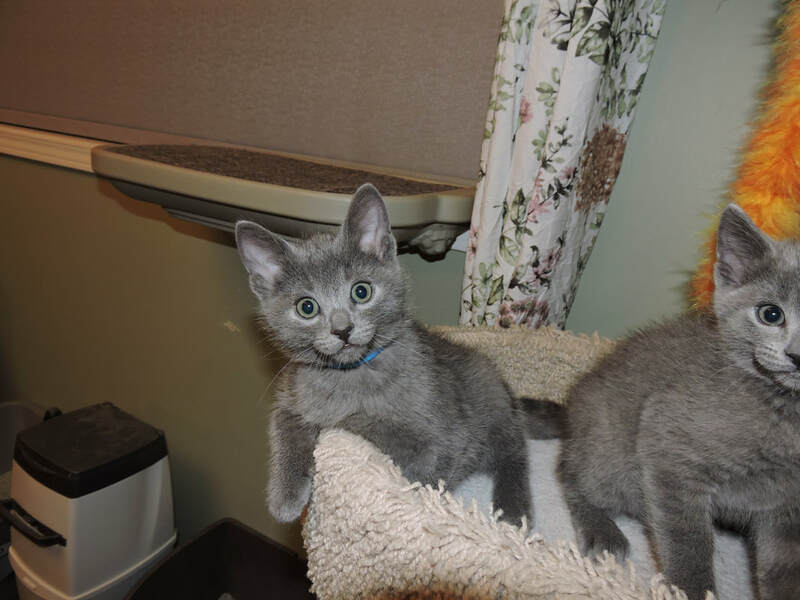 It should be a light to medium blue-grey solid color with no shadings or markings for a good show quality cat. Pet quality cats may have some very small white markings on the chin or chest, though this is considered a fault in show quality cats. Other faults are tabby markings, heavy build, and a squared or rounded head shape, such as in the British Blue. A perfect Russian Blue is very hard to find, because it takes about two years for a kitten to develop the correct eye color and coat texture and color. The Russian Blue’s almond-shaped eyes, which are set fairly far apart, may remain golden for up to two years and then turn more of an emerald green. It should be noted that Russian Blues are also born with tabby markings and a fluffy coat which fades to the solid blue-grey color and eventually becomes the adult short coat.